Memory Foam is known for its mold ability, taking the shape of your body, supporting you as well as relieving pressure points. This allows you to get into a deeper sleep by not having to move positions as often. Add some classic yet comfortable flair to your living space with this traditional yet casual style loveseat. 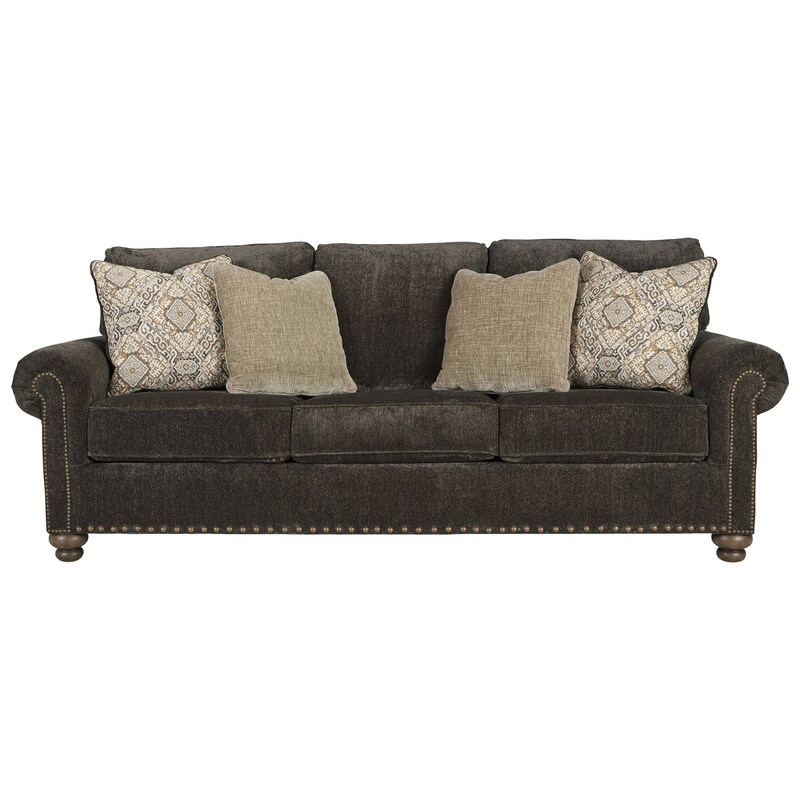 Its nailhead trim, burnished bun feet, and rolled arms provide the traditional design elements, while the throw pillows, foam seat cushions, and textured fabric provide the inviting comfort. With this appealing combination of form and function, you have the perfect place to sit back and unwind or share with friends and family. If some of those friends and family are staying overnight, you can easily turn this sofa into a queen size bed too, pulling out its memory foam mattress on top of a supportive steel frame. Since memory foam is perfect for better airflow and a cooler night's sleep, your guests will also thank you for giving them such a restful place to stay. The Stracelen Transitional Sofa Sleeper with Queen Size Memory Foam Mattress by Signature Design by Ashley at Michael's Furniture Warehouse in the San Fernando & Los Angeles area. Product availability may vary. Contact us for the most current availability on this product. Length (depth) with Sleeper Open 72"
Transform your living space into a transitional style haven with this collection of living room furniture. With their nailhead trim, burnished bun feet, and rolled arms, these pieces have a classic look. Their foam cushions and textured fabric keep their designs comfortable and welcoming as well, providing you with the relaxing retreat you're looking for. The Stracelen collection is a great option if you are looking for Transitional furniture in the San Fernando & Los Angeles area. Browse other items in the Stracelen collection from Michael's Furniture Warehouse in the San Fernando & Los Angeles area.